Marjoram Oil (wild) 10ml. Bach flower remedies, A.Vogel herbal, homeopathic and other wellbeing products from Alby, Cromer, Norfolk. Origanum vulgare, Origin: France. 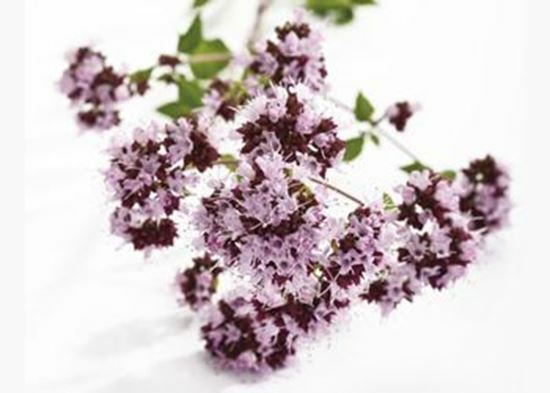 A herb with beautiful purple wildflowers, which bloom during July and August, wild marjoram has several culinary and medicinal uses. The leaves are used as herbs in cooking, especially Italian cooking such as spaghetti bolognese. Wild Marjoram (Oregano) is prized as an antioxidant. It is also highly antimicrobial and it was used primarily as an antiseptic by Hippocrates who employed it in the treatment of sore throats, respiratory ailments and digestive upsets. In more recent years it has been found to be active against MRSA, having more impressive results than many of the commonly used drugs. The essential oil is particularly useful and nurses and doctors could benefit from adding it to handwashes instead of the antibacterial soaps commonly used which actually cause the creation of further resistant strains of bacteria. A strong infusion can be used to help disinfect wounds or as a mouthwash, helping to heal ulcers and keep gums healthy.